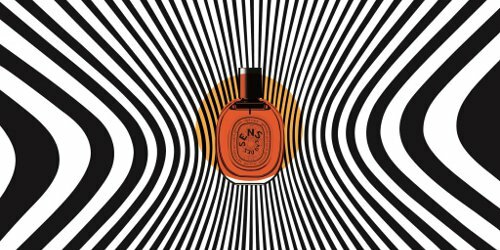 Diptyque's new Eau des Sens is meant to be a spicy orange blossom, and promises "the scent of the orange tree in its entirety, from the white petals of the orange blossom to the dark green leaves to the juicy, bitter Seville orange hanging off the branches" — I presume half of you are ready to sign up, and the other half have already moved on to the next article. That's as it should be, because Eau des Sens is pretty much what it says it is, no more, no less. Be warned, first of all, that Eau de Sens is sheer-ish, as is (mostly) the Diptyque style as of late. In the video I posted yesterday, perfumer Olivier Pescheux said that the best way to discover Eau de Sens is to "spray it generously", and I'll concur. I generally lean towards the lighter end of fragrance application: it's not unusual for me to be wearing a tiny little dab of something, and it's rare that I'd wear more than one or two sprays of anything. My sample vial of Eau des Sens is dab, not spray, and I pretty much bathed my arm in it so that I could review it, the tiny little dab I'd started off with having floated right off into the ether. Applied generously, it's quite compelling: a juicy citrus opening, followed by a pale orange blossom, on the dry / bitter side, not soapy in the least,1 summery and fresh and a bit green, with just a little tingle of a spicy undertone from the juniper berry (enough to call up a nice summer gin cocktail every so often, especially early on, but not so much as to make you feel you're wearing gin) and angelica (quite noticeable for a few minutes, then mild) and petitgrain (likewise, mild). The base is woody musk, also pale. There is supposedly patchouli, but it's surely a modern fraction — you won't hardly notice it to speak of.2 The focus stays on the orange blossom straight through to the end: it doesn't turn candied or powdered or anything else. It's completely unisex, and while you wouldn't expect a sheer orange blossom to last all day, the lasting power seems reasonable enough. Diptyque Eau des Sens is sold in 50 ($90) or 100 ($125) ml Eau de Toilette. There is also a bar soap ($26), but as of yet, no rollerball or solid (perhaps they are to follow). For buying information, see the listing for Diptyque under Perfume Houses. 1. Although I've noticed that other people often seem to find fragrances soapier than I do. So your mileage, as always, may vary. 2. I say that so frequently that I should just stop saying it, right? Probably nobody really expects patchouli in a fragrance to smell like real patchouli anymore. 3. And if you're still searching for your perfect orange blossom, do see the review for Séville à l’Aube — it includes a poll on readers' favorite orange blossom scents. Nice review Robin. Spot on. I bought a bottle and love it. I’m also a light sprayer but not with this one. I live in Southern California and this reminded me of all the orange groves in this area. I find this very natural smelling and easy to wear. Thanks again for your review. ???? Excellent, congrats on your bottle! Thanks for the info about it smelling like an orange grove. I live in Florida, and I’ve been looking for an orange blossom that has that heady, wonderful, natural smell of a grove in bloom. I tried Eau des Sens last week. I sprayed it on a paper strip, dropped in my tote bag, and the scent followed me everywhere for a few days. To me it actually seemed quite potent. I liked it – nice, straightforward orange blossom – but not quite enough to buy it. I’ll stick to Seville a l’Aube. Oh, good to know! I found it to last well on a scarf, too, but I still wouldn’t have called it as potent as Seville, would you? No, Seville is much richer and stronger. Tried this recently as well and found it to be more masculine than I prefer. I remember wrinkling my nose in the shop and saying as much and the SA was not happy about that. She thought the word “fresh” was what I was really trying to say. Lol! How helpful of her. Interesting! Wonder if that’s the juniper? I was thinking the juniper as well. Oh! I feel kind of stupid. Up until now I thought it was an incense scent, I guess because of the name. So it wasn’t really on my radar because I have plenty of that already. But now I feel I have to try it! I’ll probably check Nordstrom this weekend…. I’m not even sure if I like orange blossom but I am pretty much a citrus freak, and this time of year I love floral scents, so I’m betting I’ll like this…. Hmm, I will remember that, thank you! I do think that SL Fleurs d’Oranger is beautiful, but I’m not sure I can tell the orange blossom from the other flowers. It mostly smells like jasmine and tuberose to me. That is gorgeous and much richer than the others I mentioned, and yes, lots of jasmine especially. I also have Jo Malone’s Orange Blossom and Annick Goutal’s Neroli. I felt that this was still different enough to add it to my collection. I do love orange blossom and orange scents though. I also have Guerlains AA Mandarine Basilic which I find very different from the other three. I love the opening of L’Eau de Tarocco, and was hoping this would do that plus add a more interesting and longer lasting development. But that is not a reasonable expectation, correct? This one is way more tightly focused on ob than Tarocco, and I do not find the dry down as “meh” as Tarocco’s. But for interesting / long lasting development, I’d say L’Artisan Seville is a better bet. That dry down really was so meh. Very sad. Thanks for this review, Robin! Diptyque’s description of the “scent of an orange tree in its entirety” sounds mouthwatering, but it sounds like the scent itself is much more simple and linear. Oh, well — at least I’m quite content with my bottle of Lush Orange Blossom for those times when I need a straight-up, uncomplicated, pretty OB perfume. I don’t know that I’d necessarily call it simple, it’s just that it’s soft? More so than the Lush if memory serves. Oh, how I wish Lush hadn’t discontinued their Orange Blossom. It was my favorite. Ah, Dilmun! That’s a lovely fragrance. Much richer & more feminine than this one. I will definitely try this, and thanks for the review! I adore orange blossom, and my favorite is still the simple unadulterated versions sniffed directly from purveyors of essential oils, absolues etc. They are sheer joy in a bottle for me! So far, my favorite orange blossom perfume is Hanbury. Diptyque did such an amazing job with their Essences Incensees renditions of Mimosa and Jasmine, I’m wondering how their vision of those differs from what they’ve done here. In the case of orange blossom, I find the unadulterated version so radiant and complex that altering it in any way detracts rather than enhances my enjoyment of it. And for that matter, I’d be very interested if Diptyque did an ob in the Essences series. I did not try the mimosa, but the jasmine was great…much deeper & richer than EdS, and more of a soliflore. This does not feel like a soliflore at all, it’s more abstract than that. Ha… After reading this review, I got up and applied some Hanbury before settling in to read the comments. Hanbury’s a comfort scent for me–it is that grape-y licorice thing it’s got going… I sniffed Eau de Sens (just on paper) this weekend, and wasn’t moved. Nice pick. Eau des Sens is nicer on skin than paper, I do think, but it’s not near as lovely as Hanbury. I’ve got a number of excellent orange blossom perfumes already, but I appreciate Diptyque and will give this a whirl when I get a chance. I tried this on paper at Norstroms today. I liked it, which is saying a lot for someone with my severe FloralPhobia, but living in Florida, nothing compares to the real deal, and I find many OB scents very screechy. I didn’t try it on skin, may do that next time. I am really curious about Seville, though….. This is pretty soft and non-screechy. Gosh, this sounds nice! I like that it is unisex and not too sweet and find the juniper note intriguing.